Practice Basic Electrical Engineering questions and answers for interviews, campus placements, online tests, aptitude tests, quizzes and competitive exams. This set of Basic Electrical Engineering Multiple Choice Questions & Answers (MCQs) focuses on “Capacitors in Series”. 1. What is the total capacitance when two capacitors C1 and C2 are connected in series? 2. N capacitors having capacitance C are connected in series, calculate the equivalent capacitance. 3. When capacitors are connected in series, the equivalent capacitance is ___________ each individual capacitance. 1/Ctotal=1/C1+1/C2. Since we find the reciprocals of the sum of the reciprocals, the equivalent capacitance is less than the individual capacitance values. 4. What is the equivalent capacitance? 5. When capacitors are connected in series ___________ remains the same. Explanation: When capacitors are connected in series, the charge remains the same because the same amount of current flow exists in each capacitor. Explanation: When capacitors are connected in series, the voltage varies because the voltage drop across each capacitor is different. 7. Four 10F capacitors are connected in series, calculate the equivalent capacitance. 8. Calculate the charge in the circuit. 9. 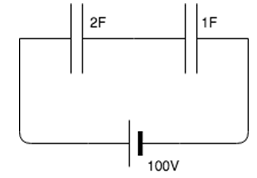 Calculate the voltage across the 1F capacitor. V across the 1F capacitor= 66.67/1= 66.67V. 10. Calculate the voltage across the 2F capacitor. V across the 1F capacitor= 66.67/2= 33.33V. 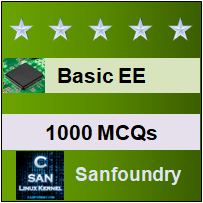 Sanfoundry Global Education & Learning Series – Basic Electrical Engineering. To practice all areas of Basic Electrical Engineering, here is complete set of 1000+ Multiple Choice Questions and Answers.